In 2013, Tissot lifts the curtain on the future of watchmaking with the launch of the world's first tactile solar watches. 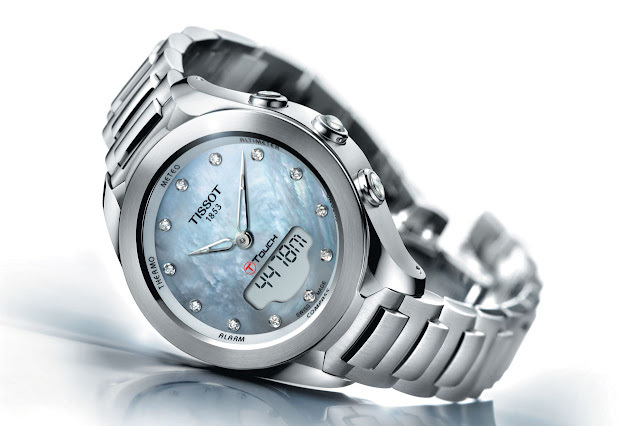 The Tissot T-Touch Lady Solar is a shimmering jewel inside a brushed and polished 38 mm case. The solar panel is completely hidden behind the dial, making room for the highly legible digital display. This groundbreaking watch lines up a host of functions: altimeter, weather station, compass, chronograph, countdown, two alarms, dual time zone, perpetual calendar and backlighting. Part of a global, environmentally-conscious approach, not a single detail has been overlooked in its flawless design. Twelve diamonds mark the hours which are circled by delicate petal-like hands.